To improve and significantly extend students’ English and Maths skills, we place a high priority on literacy and numeracy. The well-rounded learning program also includes Science, Information and Communications Technology, Humanities and a broad range of specialist subjects including a choice of French or Japanese plus Performing Arts, Visual Arts, Technology and Physical Education. We partner students and parents through their transition into secondary school by developing clear and honest communication channels, strong relationships, a caring environment and challenging learning that builds organisational skills and student confidence in their ability to learn. 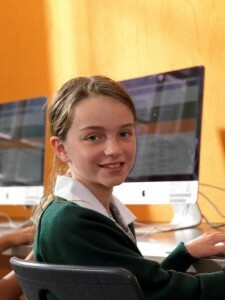 The adaptable home group area includes the latest e-learning facilities and creates a safe and central location for young students within the main school. The larger central space enables students to work cooperatively with their Year 7 peers, while defined class areas provide an appropriate and highly effective setting for directed teaching and study. This program provides a safe, caring learning environment based on cooperation and responsible behaviours to self and others in a state-of-the-art highly resourced, flexible learning centre providing specialised learning areas for both independent and collaborative study. is staffed by a dedicated team of teachers highly skilled across all learning areas. Students’ lockers are close to their learning centre and they have an area for play specifically for Year 7. This builds a sense of safety and security for our 11 and 12-year-olds and gives them the confidence to excel and venture further in Year 8. More information about the program is available In the Year 7 Handbook. Booklists and SEAL Booklists are also prepared and available for each year level.